Jam-making is a calming process for me. When fruit begins to become overwhelming on the counter, spilling out of bowls and taking up too much space, I have no problem turning it into a simple jam. Cutting the fruit into small pieces and tossing it in a saucepan to bubble and boil, each batch is as unique as the others—some sweeter, some more tart—with a mix of flavors that comes from the extra ingredients in the cupboards. 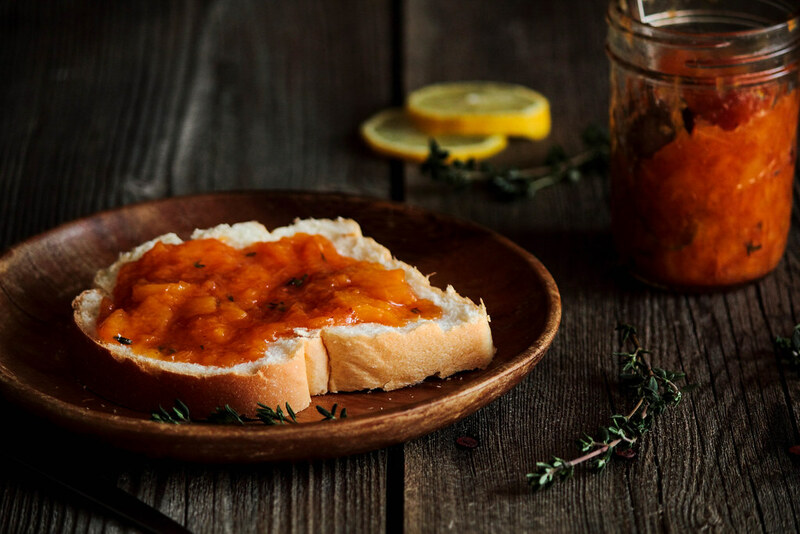 Jam may be simple to make, but the scents that infuse the house as the fruit cooks down is why homemade jam is worth the time. My grandmother is well known in my family for creating vibrant strawberry jam. Every few months, she will simmer another batch over the stove, dividing it into small plastic containers, and freezing it until we pay her a visit. She makes certain the strawberry jam fountain never runs dry. My grandmother has faithfully made her strawberry jam for as long as I've known her. In those twenty-four years, I've created so many simple, strawberry-filled moments with sticky knives and happy faces. Her jam is perfect on a freshly baked bun, warm and inviting—a treat I get to enjoy whenever the holidays come around. 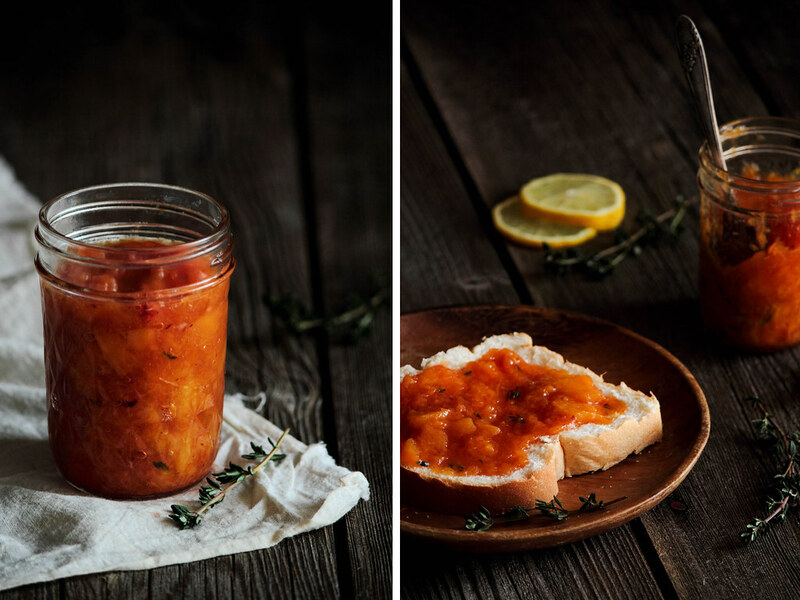 Despite the love for my grandmother's jam, I truly believe different moments call for different flavors. The classic peanut butter and jelly sandwich just wouldn't be the same without a thick spread of grape jelly that oozes out from the crust of the bread as a bite-sized piece disappears. My mother's go-to barbecue sauce recipe uses grape jelly to bring in a depth of flavor (which I have been known to shamelessly eat with a spoon when my mother's back is turned). 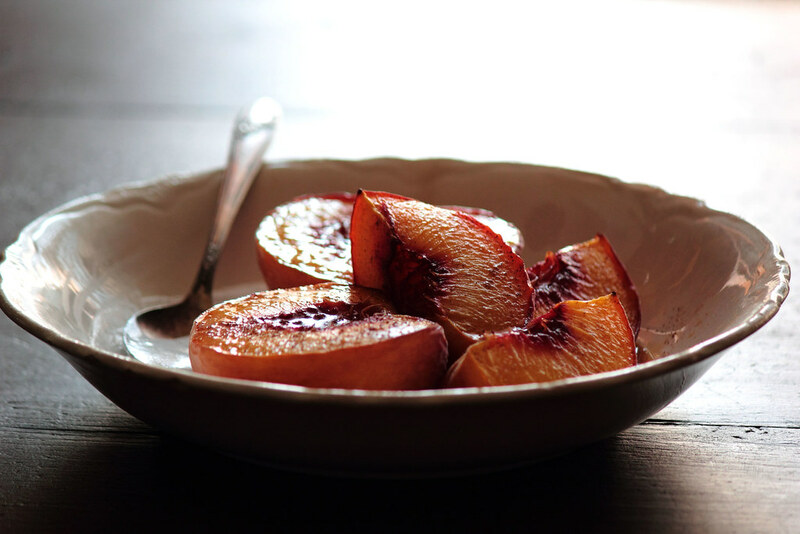 A spoonful of fig or strawberry balsamic jam blends seamlessly into a scoop of vanilla ice cream. At a holiday craft fair in Montreal, I stumbled upon the most unique jam I've ever had the fortune of tasting. It was a cedar jam, derived precisely from cedar trees in a nearby forest. The sample I tried was electric, the taste reminding me strongly of the tree-scented scratch-and-sniff sticker in my childhood book, The Little Mouse, the Red Ripe Strawberry, and the Big Hungry Bear. The instant memory and surprising flavor led me to buy a small jar of my own. I'm still waiting for the perfect occasion to open it. 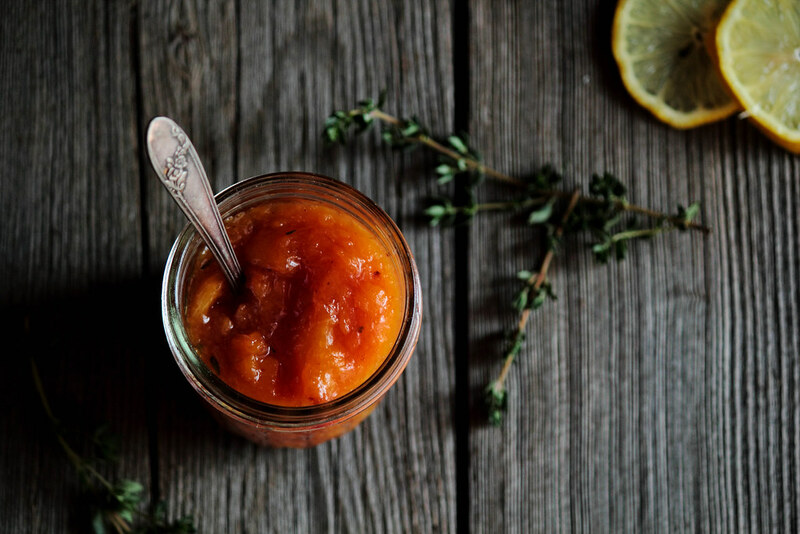 The right moment to savor this Bourbon Peach & Thyme Jam found me. In a way, the jam seemed to form of its own accord, as I found myself tossing a little of this and that from the cupboards into the saucepan. Still warm from simmering, I spread a thick layer onto a slice of fresh bread and enjoyed it as the summer sun set, turning the sky into a spell of pink and orange hues. 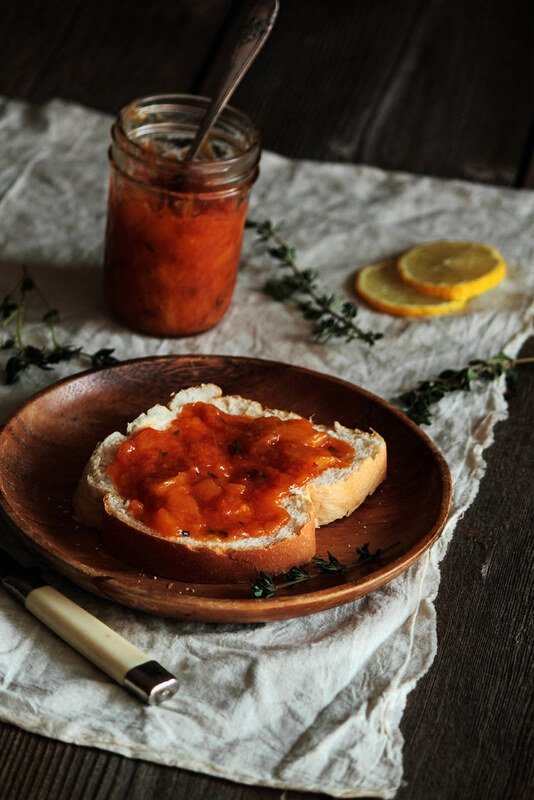 Bourbon Peach & Thyme Jam contains a myriad of flavors that come together in an unexpected, but lovely marriage. 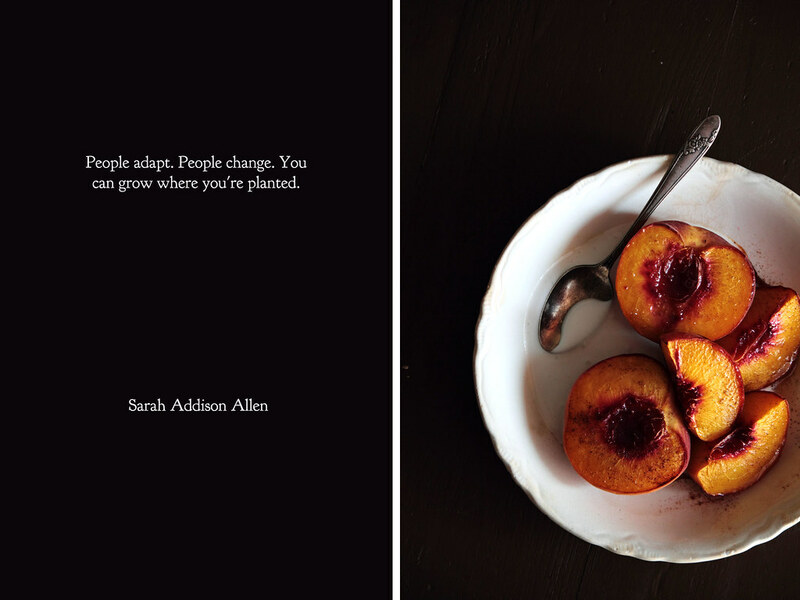 Fresh peaches are peeled and sliced into small pieces, joining freshly minced thyme and a splash of bourbon. 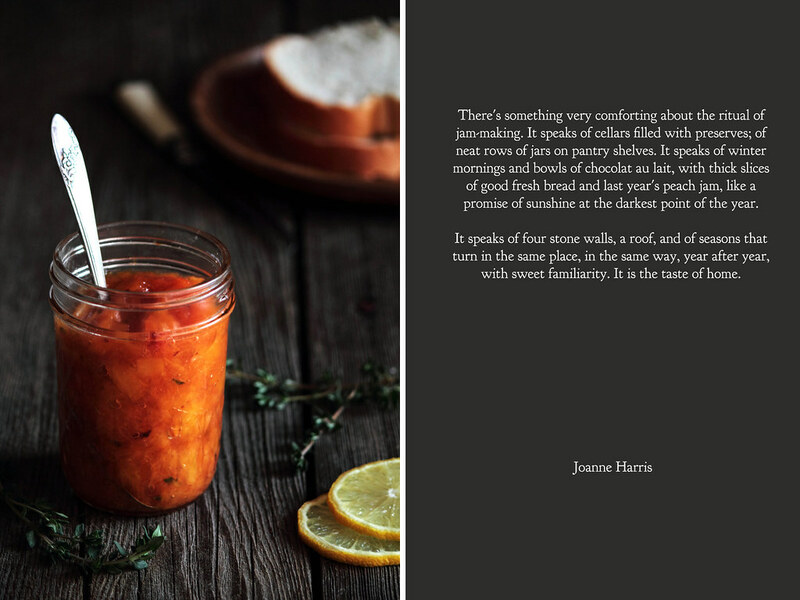 The jam simmers on the stove, infusing the room with bright scents and swirling steam. I love to sneak a taste with a spoon while the jam bubbles on the stove top (and I suggest you do the same). Long, languid summer afternoons are quickly becoming fond memories as I find myself surrounded by textbooks and a mountain of responsibilities. For many reasons, I wish I could go back to those summer days, despite the heat swells that kept my apartment at a blistering degree. The transition between seasons always feels unexpected to me; no matter how much my brain anticipates its arrival, my body falls into a state of confusion. The hot air from summer days still plagues me as I walk around sweating in a pair of blue jeans and a sweater, questioning why I expected cooler temperatures just because the routines of fall had arrived. Between the transitions, I get caught between the seasons, wearing skirts in chilled temperatures and turning on the oven when the warmth of summer hasn't gone. Part of me is still drawn to summer, as I buy fresh berries for my breakfast, purposefully overlooking the rising price of the fruit. I bought my last bag of cherries for the season at the market last week, the moment hitting me unusually hard as I realized summer was truly coming to an end. My sister, on the other hand, has been ready for fall for the last month. Ahead of the game, her new fall wardrobe has already been purchased, hanging in the closet as she anxiously awaits the temperatures to drop. Perhaps most of all, she has been looking forward to the flavors of autumn. Filling my inbox with pumpkin recipes I must make for her, she can't stop talking about eating her weight in pumpkin cheesecake. In a way, the two of us complement one another—as I grasp onto the remains of summer, she is fully embracing the spice of fall. Together we are helping each other through the transition of the seasons. 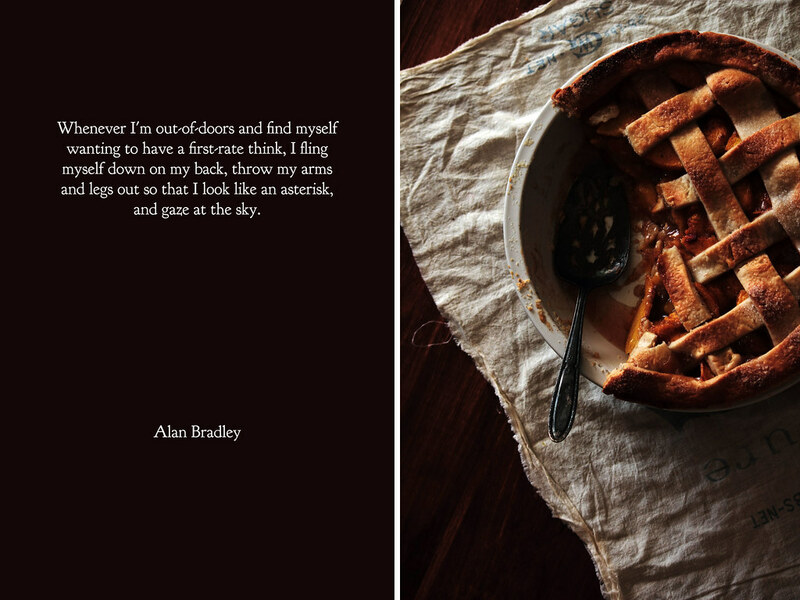 Last weekend, I was trying to find a recipe that reflected this passage of weather and life. The morning was unusually cool and overcast, as I snuggled into the couch with a blanket around my shoulders and warm socks covering my toes. For the first time in months, the temperature had dropped in my apartment and the thought of turning on the oven finally seemed like a perfect idea. After months of looking for no-bake recipes or recipes with limited baking, I missed my oven and the warmth it could bring into bodies and homes. I turned it on, rolled out pie dough on the counter top, and somewhere along the way this pie took form. 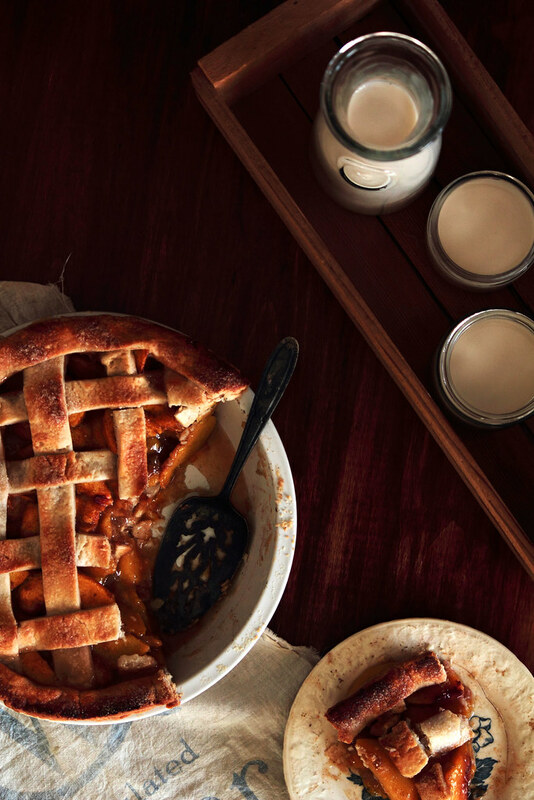 The fresh fruit of summer and the spices of fall combine to create a pie for transitions. As if to live up to its purpose, the weather began to clear while the pie cooled on top of the oven. Just as I cut into the first piece, I heard a splash from someone jumping into a nearby pool. 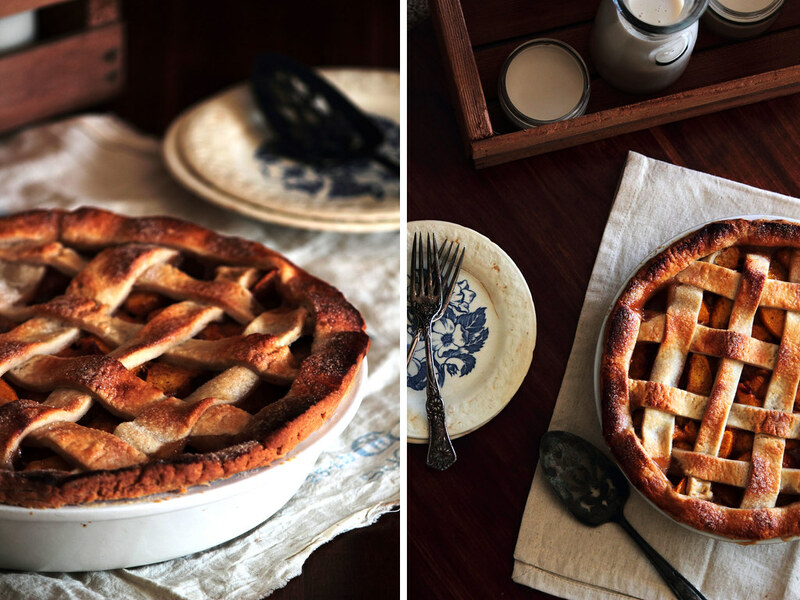 While the weather (or your heart) may be between seasons, this pie will help to bridge the gap, creating a space where you can enjoy a slice of both at precisely the same time. 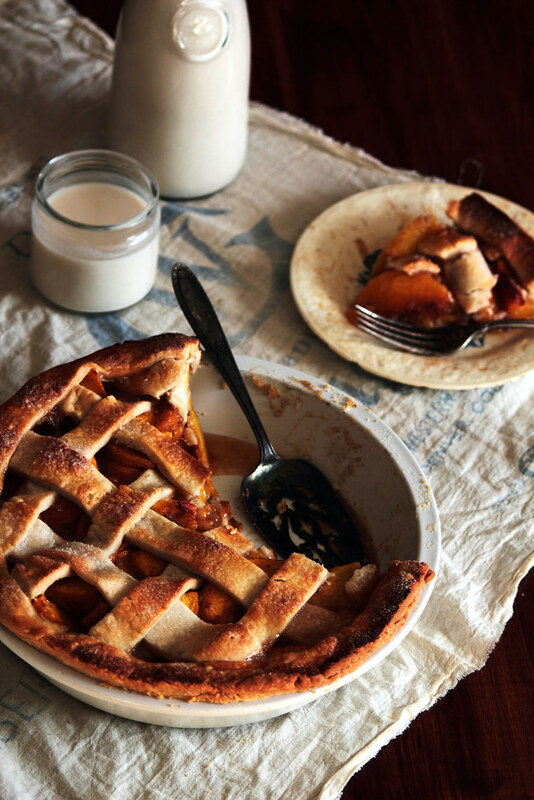 Vanilla Bean Cardamom Peach Pie is bright and fragrant, with a sugar sprinkled crust to hold in the flavor. Fresh, ripe peaches combine with aromatic cardamom and a hint of vanilla, baking in the oven until the fruit softens and bubbles in its own juices. You may choose to use whichever pie crust recipe you prefer (I've provided a link to my favorite below), but as long as it bakes up golden and flaky, you can do no wrong. Whether you are still longing for summer or waiting to embrace the flavors of fall, this pie will be suited just for you. Fresh garden vegetables are one of the few reasons I look forward to the end of summer. Newly harvested vegetables are among my favorite summer pleasures, as I admire the bright colors and fresh scents of ripening plants. The sharp snap of a tomato being picked from the vine and the hard tug on the top of a buried onion remind me once again why food has become such a large part in my life. There's something unique about burying your hands in dirt to uncover the carrots hidden below—I'm always curious to see how large they have grown—or find the ripe cucumbers hidden among the plants' leaves. This year I don't have a backyard garden to tend. Since moving away from home, I'm suddenly much farther from the garden in my parent's backyard than I might like. While I don't miss looking after the plants myself (I've never been much of a gardener), I do miss the rewards after a few months of hard work. I tried to start a small herb garden on my apartment balcony, but the plants died a miserable death relatively quickly, shriveling under the sunlight despite the careful watering. The plants, now a shade of brown and death, still sit on the deck. I ignorantly hope they will come back alive overnight and surprise me by sprouting new leaves, but I have a feeling that little fantasy won't come true. Fruit is one of my favorite parts of the summer harvest. My kitchen is often filled with several pounds of sweet berries, as they vie with the stone fruits for counter space. 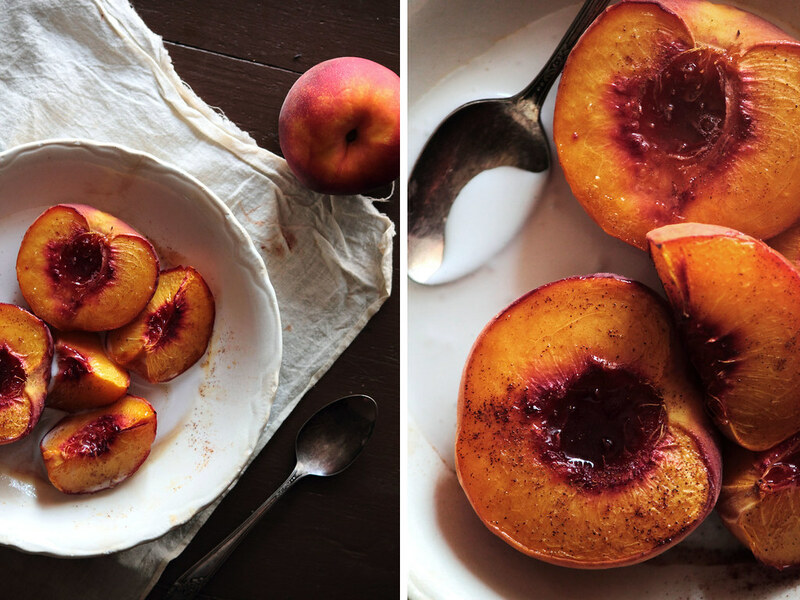 When I'm not certain if my stone fruits are ripe and ready to eat or still in transition, I like to roast them in the oven or cook them on the grill. Roasting fruits brings out a deep flavor and caramelizes the sugar in the fruit, creating a masterpiece out of the most unremarkable of fruits. With a sprinkling of sugar and a dash of spice, roasted fruit can easily take center stage to a summer meal. 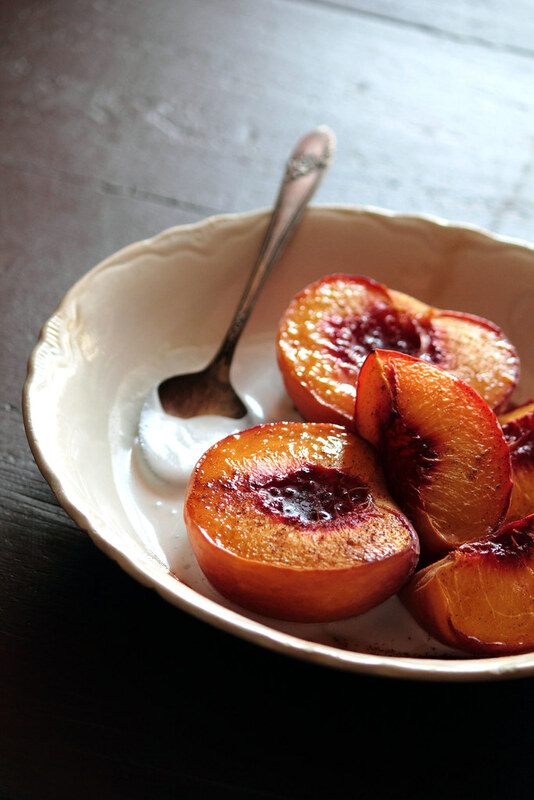 Maple Roasted Peaches are a sweet way to enjoy fresh summer fruit. I almost don't need to share a recipe for roasted peaches with you because they are so simple to make, but the combination of maple syrup, cardamom, and coconut whipped cream is honestly something special. The coconut whipped cream needs to be made the evening prior (or at least 8 hours before serving), so it does require a bit of thinking ahead, but you could certainly substitute the coconut whipped cream for traditional whipped cream, yogurt, or vanilla ice cream.